2012-10-07 ~ National Association of Postal Employees, Tirunelveli Division. Sri.D.Theagarajan, secretary general of FNPO has written a strongly worded letter to The DG, dept. 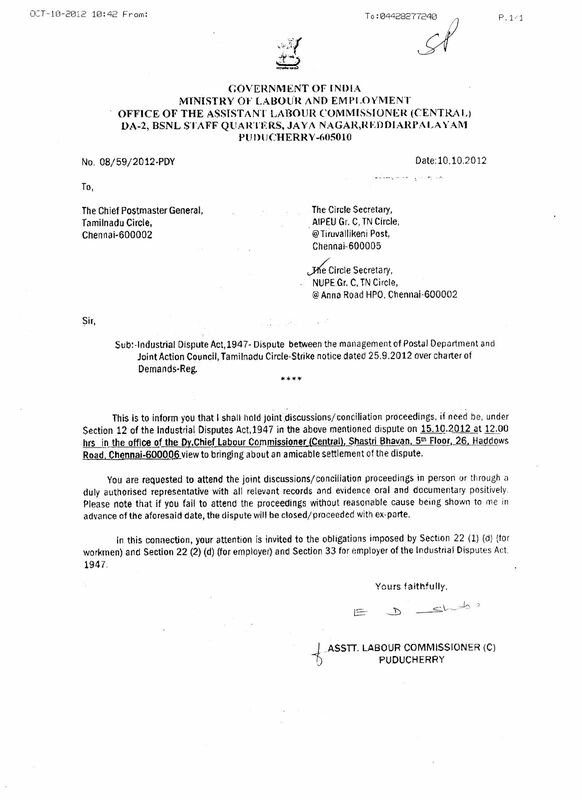 posts on 28-09-12over the tortures and harassment meted out to the Trainees at Postal Training Centre Madurai by the Director PTC in the past two years and citing the latest incident of Sri. N.Jayakumar, suicide at PTC Madurai, and also reminding earlier representations done to Directorate in this regard , he has demanded the Director -General to conduct a impartial enquiry over these atrocities immediately , and pending enquiry the Director PTC Madurai must be shifted immediately to ensure the fairness of the enquiry. ஆண்மைத்தனமாக (இருந்தால் ) இயக்க ரீதியாக ஆரோக்கியமாக போட்டியிட வேண்டுகிறோம். Our Sincere thanks to Tamilnadu P3 Circle Union and Our beloved Circle Secretary Shri G.P.Muthu Krishnanji for giving this opportunities to conduct Circle Working Committee Meeting from 04.11.2012 to 06.11.2012 and Circle Council Meeting on 05.11.2012 & 06.11.2012 at Tirunelveli. We welcome the all Divisional / Branch Secretaries and All Circle Working Committee members to attend in this function. Our Federation Secretary General Shri.D.Thiyagarajan, P3 General Secretary Shri.D.Kishan Rao and GDS General Secretary Shri.P.V.Muralidharan will also attend in this function. We also request the all members to book their railway/Bus Tickets early to avoid eleventh hour rush. The Competent Authority has now ordered to conduct the Limited Departmental Competitive Examination for Postmen/Mail Guard and Multi Tasking Staff as per the following schedule. The vacancies for the year 2013 may also be included while notifying the Examination and also notifying the vacancies. The Minutes of the 5-10-2012 Meeting held between Chief PMG and JCA Leaders was supplied to the JCA on 8-10-2012 by DPS Hqrs in person. Minutes was not reflecting the discussion. Mainly following items were twisted in the minutes. The Chief PMG said the enquiry will be headed by PMG CCR, but inthe minutes it has been stated as DPS Hqrs. The JCA is not acceptable to this, because both are in the same rank of DPS. Secondly, The Enquiry will be confined to only suicide of the Trainee at PTC,contrary to the accepted point in the discussion that all the complaints hither to submitted by the individuals and unions against the atrocities of PTC Director, Madurai will form part of the Enquiry. Therefore this was also not acceptable to the JCA. Contrary to the assurance that ,further Mid-Career development programmes will be kept in abeyance till the enquiry is over has also been changed as for only one week .This is also not acceptable to the JCA. And finally it was mentioned that , the unions agreed to defer the strike to be held on 11-10-12, which was not so. participate this glorious task to arrest the atrocious behaviour of the high handed officers. இயக்குனர் அஞ்சல் பயிற்சி மையம் மதுரை அவர்களின் கொடுமைகளுக்கு எதிரான , நம் தோழர் ஜெயகுமாரின் உயிர்பலிக்கு நியாயம் கேட்டு 11.10.2012 நடைபெறவிருந்த வேலை நிறுத்த போராட்டம் வருகிற 18.10.2012 க்கு JCA வின் முடிவின்படி தள்ளிவைக்கபட்டுள்ளது. நமது தலைவர்கள் கோரிக்கைகளில் உறுதியாக உள்ளனர். 05.10.12 அன்று காலை தொழிலாளர் நல ஆணையர் முன்னிலையில் நடைபெற்ற பேச்சு வார்த்தை குறித்தும் , பின்னர் மதியம் அதன் மீதான CPMG, TN உடன் நடைபெற்ற இரு தரப்பு பேச்சு வார்த்தை குறித்தும் நமது FNPO வலைத்தளத்தில் பிரசுரிக்கப் பட்டிருந்தது. திங்கள் அன்று பேச்சு வார்த்தையின் பதிவு செய்யப்பட்ட MINUTES COPY கிடைத்தவுடன் இதன் மீதான அடுத்த கட்ட நடவடிக்கை குறித்து JCA கூடி முடிவெடுத்து அறிவிப்பதாக தெரிவித்திருந்தது. தொழிற்சங்க போட்டிகள் ஆரோக்கியமாக உள்ளதா ? கடந்த சில தினக்களுக்கு முன்னால் ஒரு மொட்டை கடிதம் சில ஊழியர்களுக்கு அனுப்பப்பட்டுள்ளது. அதில் குறிப்பாக SPOs, ASPOs(HQ), SC/ST மற்றும் சில பெண் ஊழியர்கள் மீது சேற்றை வாரி இரைக்கும் முயற்சிகள் நடைபெற்றுள்ளன. தங்கள் சுய லாப நோக்கில் நமது சக பெண் ஊழியர்களையும் விட்டு வைக்காமல் தவறான பாலியல் சிந்தனையோடு குற்றச்சாட்டுக்கள் கூறப்பட்டுள்ளன. மொட்டை போடும் யாரும் தங்கள் பெயரை போடுவதில்லை. ஆனால் இந்த புத்திசாலிகள் (?) தங்களை ஒரு அணியினராக காட்டியுள்ளனர். இவர்கள் அதிலும் தங்கள் எதிரணியினரை கேவலபடுத்த அவர்கள் பெயரை போட்டுள்ளனரோ என ஐயப்பட தோன்றுகிறது. கோட்ட நிர்வாகம் தக்க நடவடிக்கை எடுக்கும் என ஊழியர்கள் குறிப்பாக பெண் ஊழியர்கள் எதிர்பார்க்கின்றனர். கோட்ட நிர்வாகம் நடவடிக்கை எடுக்குமா ? At 15.30hrs on 5-10-12, Talks on Strike Notice with Chief PMG Ms.Hilda Abraham held. DPS[Hqrs] Sri.J.T.Venkateswarlu also participated. All Circle secretaries of JCA participated. Unions were sticking to the demands of Strike notice. Chief PMG after the discussion, finally announced that she will order for free and fair enquiry on the complaints against the PTC Director Ms.Nirmala devi. Enquiry will be conducted at the Circle office,Chennai. Based on the findings of the enquiry an appropriate action will be taken with out any hesitation, again on 16-10-12 we will have a meetings to discuss about the findings of the enquiry report.Meantime , the Chief PMG will go to Madurai on 9-10-12 and discuss all these issues with Director, PTC and DPS southern Region. Our JCA insisted pending enquiry the Director PTC must be transferred, this was not accepted by Chief PMG, telling that without enquiry these are not possible.Then JCA insisted if transfer is not considered theDirector PTC may be asked to on leave. This was also not accepted by the Chief PMG on the same grounds. Then JCA met and decided to put a demand that till the enquiry is over Mid-Career development training's must be stopped . Then JCA leaders met the Chief PMG and the Madam agreed to this demand. Recording all these items the minutes will be supplied by the Circle office on Monday on 08-10-2012. On getting the Minutes the Circle JCA will take final decision on the Strike. Assistant labour commissioner[c]. Sri.M.Natchimuthu, AD SR&WLF,participated on behalf Chief PMG. As per the Call of Circle JCA, in the evening on 5-10-2012, a Massive Demonstration was conducted in front of the Regional office, Madurai against the atrocious and savage treatment meted out to the officials by the Director, Postal Training [ Torture ] Centre, Madurai and DPS Southern Region. More than 400 officials including100Women from the Madurai,Theni,DindigulSivaganga,Virudhunagar, Kovilpatti,Tuticorin, Tirunelveli etc.of Southern region ferociously participated in the Demonstration . Leaders of the FNPO,NFPE,GDSUnions G.Baskaran, K.Narayanan, S.Thiagarajan S.Pandian, S.Sundaramurthy, M.muthusamy, N.J.Uthayakumaran,R.Ganesan, Jacobraj, K.V.Rajan addressed the gathering, focussing the atrocities of these two officers and demanding with the appropriate disciplinary actions on these two inhuman officers. When the demonstration was going on ,Circle JCA got the information that the Police force was called in by the DPS Madurai not to allow to conduct the Demonstration.By this time as the discussion was going on by Circle JCA with the Chief PMG Ms.Hilda Abraham on Strike Notice, the Circle JCA immediately informed this matter to the Chief PMG, Madam in turn immediately called the DPS Southern Region and gave strict instructions that no police action should be there at Madurai for conducting Demonstration. Then the JCA Leaders from Madurai immediately informed us Police left the Place. For this effective intervention we conveyed thanks to the Chief PMG. Circle JCA, salutes the Sothern Region JCA Leaders for having organised such a heroic Demonstration.